Dasmantpur is a tribal block in Koraput district of Odisha. Here, on the hilly and denuded land, the tribal communities have been traditionally practicing shifting cultivation of subsistence crops like millets and pulses supplemented by collection of forest fruits, roots, honey etc. However, destruction of forests due to commercial over-exploitation over the last 3 to 4 decades has decreased the productivity of the soil. This has severely threatened the well-being of the tribal community which depends on agriculture and forest, forcing them to be bonded and migrant labour; increasing their indebtedness; and exploitation of forest produce for income. The fragile eco-system of the upland tribal regions has also been affected by deforestation and rampant shifting cultivation practice, causing extensive soil erosion, reducing the capacity of land to rejuvenate and affecting natural vegetation and water resources. 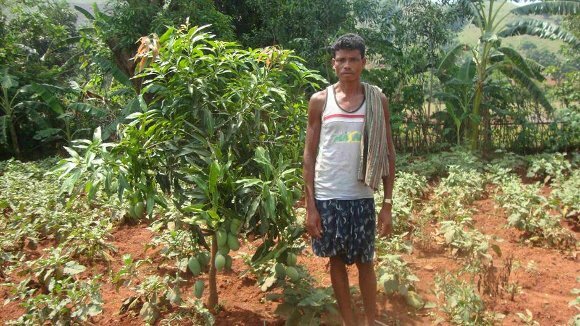 The National Bank for Agriculture and Rural Development (NABARD) has been supporting various welfare projects for Scheduled Tribes in the country under its Tribal Development Fund. The Wadi project is one such integrated tribal development initiative of NABARD. Wadi in Gujarati means an orchard. Under the project a Wadi plot usually covers one acre per beneficiary who must be a marginal farmer not having more than 5 acres of land. Two or more crops are strategically selected for intercropping in the Wadi model to minimise climatic, biological and marketing risks. 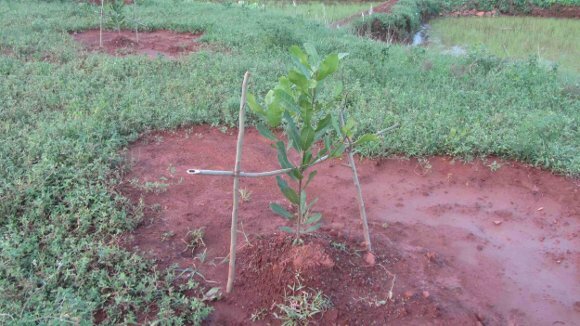 In each acre fruit trees like cashews, mangoes, litchis etc are planted with the agricultural crops. The main features of a Wadi model are economic upliftment of the farmers through sustainable agriculture, social empowerment, improvement in quality of life including health and women empowerment in tribal dominated areas of the country. The broad interventions are in the areas of land use planning, soil and water harvesting measures and improved farming based agro-forestry practices. Therefore, Wadi not only strengthens the agrarian livelihoods of the tribal households, but also increases food and nutritional security. Considering the extreme poverty, land and climatic conditions, NABARD sanctioned a Wadi project in 37 villages covering 1116 tribal families of Dasmantpur block and Agragamee became the Principal Implementing Agency of the project in the targeted region. Exposure visit for the tribal farmers was organised as the first step of the project and they gained hand on experience at Gujarat where Wadi plantations started during the 1980s. Water and Soil conservation: Although Dasmantpur receives moderate to high rainfall, due to its steep slopes and rocky terrain, water retention is poor resulting in severe soil erosion and nutrient loss. To protect the fertile top surface runoff during the monsoon, and to increase moisture retention in the Wadi plots, earth and stone bunding, platforms, trenches and ring basis were introduced. Protective irrigation systems such as ring wells, check dams and diesel pump sets were used. The gully treatment and bunds slowed down the flow of water and stemmed erosion; the groundwater levels improved. This significantly increased the cropping intensity. Intercropping: To optimise land use and cater to short-term needs, intercropping is used to cultivate a range of crops like grams, millets and vegetables. Tomato, brinjal, beans, chilly, pumpkin and various pulses like arhar, chickpea, pigeon pea, black gram are grown by the farmers which provide rich nutritional food to their family while the sale of the surplus crops supplements their income. Organic Farming: The Wadis were supplied with organic manure for growth and soil revival. Sixty-five vermi compost pits were constructed under the project where cow dung and goat droppings were used for composting. The rich compost improves soil fertility and reduces dependence on chemical fertilizers, thus facilitating production of organically grown produce in the region. Measures were taken to prevent termite, bacterial and fungicide attack by using neem cake and cow urine. All these efforts increased the natural fertility of the soil and boosted production. Local community building: To ensure sustainability of the project, it is highly important for the local communities to participate and own the process. A group of 10 farmers who have compact land up to a minimum of 5 acres form a Udyan Vikash Samiti (UVS) The concept behind forming these organisations is to assure better aftercare activities, and marketing. Till date eighty three UVS have been formed, and each has been provided capacity building and skill up-gradation training on orchard development, income generation and resource mobilisation. All UVS were helped to open their respective bank accounts for smooth and transparent fund flow. Now, formation of Producers Company is in process, which will ensure better forward and backward linkages for the farmers. Fifty women Self Help Groups (SHG) consisting of 741 members were also formed and many of them have been involved in successful micro-enterprises. These factors have collectively helped in developing saving habits, reducing dependence on moneylenders and one can see growing confidence amongst the tribal women. Special attention has been given to 157 landless households by providing them support for animal husbandry, a multi-purpose utility shop, tailoring unit, vegetable vending unit, and cycle repair shop. Under the Wadi project distress migration in the region reduced by 30 percent. On average, each farmer is able to earn Rs 8000 to Rs 10000 per year from his Wadi, which has given him funds to invest in repairing their houses and purchasing other household needs. 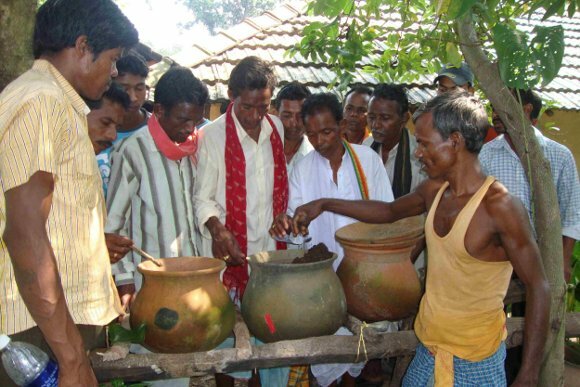 Bonasil is a tribal dominated village consisting of 90 households, the majority belonging to the Kondha Paraja community of Adivasi. Bonasil became a model village under the Wadi project gaining attention from the neighbouring villagers, government officials and development activists for its lush green Wadi plots with mixed croppings of vegetables, grams and orchards. Dipai also added that previously land was rocky, less productive and had no irrigation facility; making a good harvest a distant dream for the farmers. 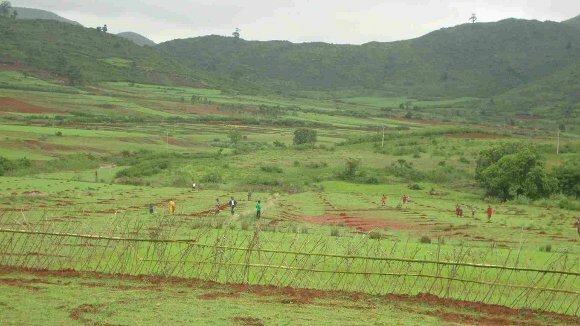 The initial task was to develop land through earth and stone bunding, priority was given to fencing for protection from cattle and once the land was developed and fenced, fruit saplings and intercropping was used extensively. Gradually their rocky land was converted into green Wadi plots. During Kharif season dwarf varieties like finger millet, green gram, black gram, groundnut and various vegetables are cultivated as intercrops. In Rabi season chickpea, pea, masoor, sunflower and vegetables are cultivated. “Last year I earned Rs 11500 after selling the intercrops. With that money I have repaired my house and purchased a pair of goats”, says an overwhelmed Danua. Seeing Danua’s success, other farmers too accepted the Wadi model. From year 2011 to 2014, a total of 56 farmers adopted the model. Every month a meeting is organized by the UVS of Bonasil and collective decisions are taken, one Yubak Sangha and 2 SHG were also formed in the village. The Wadi project has significantly improved the socio-economic life of every farmer in the village, more importantly younger generation is showing interest in Wadi model. This has reduced the rate of distress migration. There is no doubt that Wadi is a holistic and replicable model for sustainable livelihood of tribals in other parts of the country. Abhijit Mohanty is associated with Agragamee, Odisha and writes articles on tribal development issues. Kieran Robson and Rosie Clarkson are students at the University of East London studying International Development with NGO Management, currently on placement at Agragamee.